I was asked to make this into a widget for him, and re-made the graphics. 09/29/05 - Made smaller, added all the system info to it. Visually great, but personally I'm sick of weather and meters widgets. That's not a criticism of you, I'm just wondering whether others aren't sufficiently excited by these types of objects in general to comment. Other than that, the rating is good so I'd assume that no news is good news! 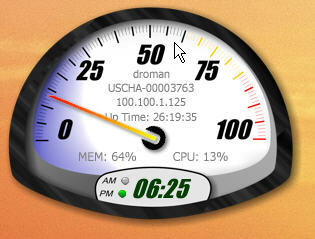 I get no time display and the cpu gauge doesn't work. Emtp563 - this has been a problem in DX for a long time. Clear the dx cache, and make sure your at the latest version. Look in the articles for more info. I like the gauge, but the time is running 25 seconds behind my system time?? I have other clocks running and only this one lags. Its in a timer, so the timer runs every 30 seconds to save cpu cycles. Import it and edit the script to every 10 seconds and that would fix the lag i think. RomanDA, can you tell me how you made the D-odometer. I have been trying to figure out how to make analog meters, but I don't know how to put a needle onto a meter so that it will work right. If you can help me. please let me know. Thanks. How do I get the time to display? It did at one time, but now does not. I cleared cache but that didn't work. AM/PM lights up but time is blank.